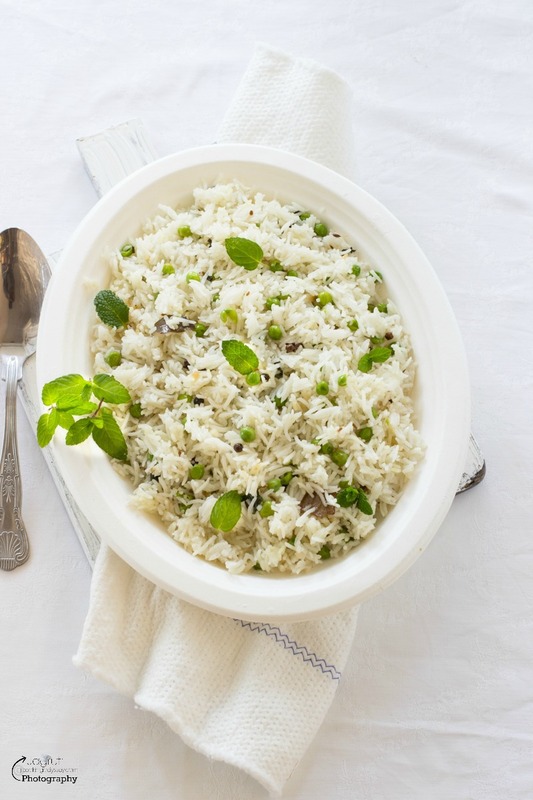 Green Peas and Mint Rice, classic combination, a must try dish for everyone ! Prepare on any occasion, you won't go wrong. I love everything about this recipe! Ingredients, method and the taste..everything is just right, this recipe is a no-brainer. This aromatic and healthy rice pairs well with robust and strong flavoured dishes like Daal Makhni, Chana Masala, Garlicky Daal and Gujarati Kadhi. 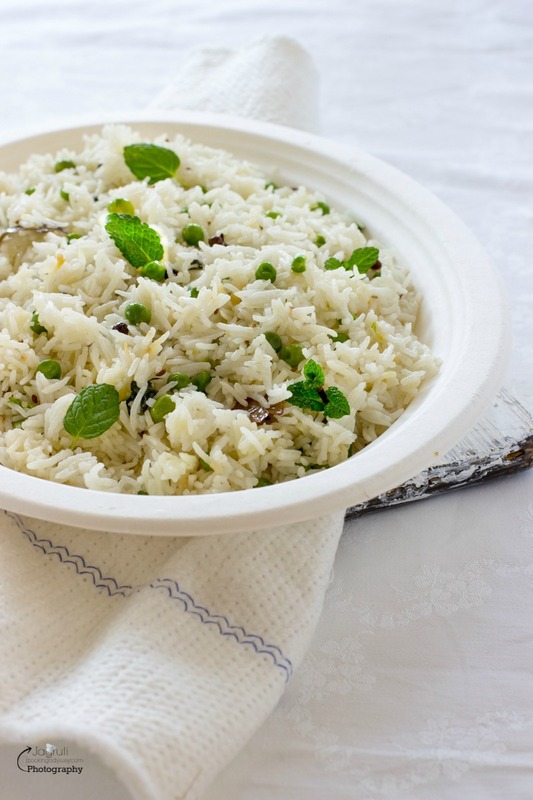 This rice recipe is versatile, have it with Daal or Curry or just have hot with Raita. Wash and soak basmati rice for 30-40 minutes. Heat oil in a wide pan or kadai, add cumin seeds and whole spices. Add salt and bring the water to boil. Discard water from the soaked rice, gently tip in the rice. Keep heat high for 5-7 minutes without covering the pan. Now turn the heat very low and cover the pan and let the rice cook. It will take another 8-9 minutes. Check the rice, it should not be mushy. Add chopped mint ( reserve couple of leaves for garnishing ) and switch off the heat. Let the rice cook in it's own steam. After 10-12 minutes, with fork separate every grain. Serve piping hot with daal, curry or raita. I am sharing this recipe with Eat Your Greens co-hosted by Shaheen and The Veg Hog . Hi Shaheen, thank you for lovely words. Hope you enjoyed browsing JCO. Keep in touch. Warm wishes !